The Zhou Dynasty ruled Ancient China from 1045 BC to 256 BC. It was the longest ruling dynasty in the history of China. The land of Zhou was a vassal state of the Shang Dynasty. A powerful leader of the Zhou named Wen Wang began to plan to overthrow the Shang Dynasty. It took many years, but finally Wen Wang's son, Wu Wang, led an army across the Yellow River to defeat the King of the Shang Dynasty. 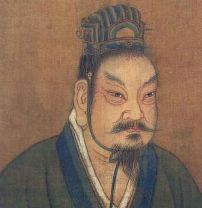 King Wu established a new dynasty, the Zhou Dynasty. The early leaders of the Zhou Dynasty introduced the idea of the "Mandate of Heaven". This concept taught that the leaders gained their authority to rule from the gods. They believed that when the Zhou overthrew the Shang Dynasty, this was because the Shang had become tyrants and the gods allowed them fall. The government of the Zhou was based on the feudal system. The emperor divided the land into fiefs that were usually ruled by his relatives. The nobles who ruled the fiefs basically owned the farmers who worked their lands. The latter period of the Zhou Dynasty is famous for the beginnings of two major Chinese philosophies: Confucianism and Taoism. The Chinese philosopher Confucius lived from 551 to 479 BC. Many of his sayings and teachings impacted the culture and government throughout the rest of the history of Ancient China. Taoism was introduced by another famous philosopher Lao Tzu. He introduced the concept of the yin and the yang. Several technological advances occurred in China during this period. One was the invention of cast iron. This enabled strong and durable iron tools and weapons to be manufactured. Other important innovations included crop rotation which allowed more efficient use of the land and the addition of soybeans as a major crop. The Zhou Dynasty is often divided up into the Western Zhou and Eastern Zhou periods. The first part of the Zhou Dynasty is the Western period. This was a time of relative peace. Around 770 BC the Zhou king lost control of some of his territories. Many of his lords rebelled and took over the capital city. The son of the Zhou king escaped to the east, however, and built a new capital. The dynasty that ruled from the new eastern capital is called the Eastern Zhou. The first part of the Eastern Zhou is called the Spring and Autumn period. During this period the lords of the states became somewhat independent and didn't really follow the king. They did what they wanted and often fought amongst each other. By the end of this period many of the lords had conquered each other to where there were only seven main states. This period began around 475 BC and lasted up until the end of the Zhou dynasty in 221 BC. There were seven major states left in the empire. It was clear that they would fight each other until only one was left. At the end of this period the leader of the Qin state, Qin Shi Huang, conquered the other six states and crowned himself as the first emperor of a united China. A lot of the bronze vessels made during this time had detailed inscriptions on them. Archeologists have been able to learn a lot about the Zhou from these inscriptions. One of the most popular pieces of literature was a collection of poems called the Book of Songs. Battles between the states were generally fought under a strict set of "rules". The soldiers of the time were considered chivalrous and fought with honor. The famous book on war the Art of War was written by Sun Tzu during this time. Although iron was introduced during this period, the Zhou are most famous for their work with bronze.